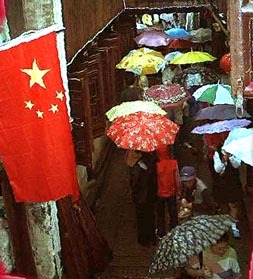 WuZhen (above) is another nearby “water town” which boasts a 2000-year history. We enjoyed exhibits showing how fabric has been made here from both cotton and silk. 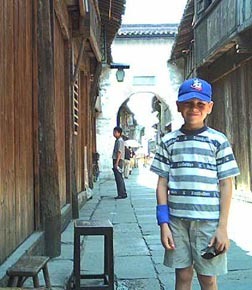 Below, Andrew pauses in WuZhen’s narrow main street (2002). 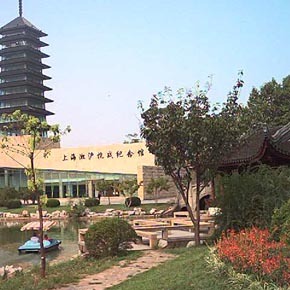 Bao Shan lies on the Yangtze River with convenient access to the Pacific Ocean. It's famous for steel production, but also contains this lovely park and memorial to the resistance against Japan's invasion in the 1930s. 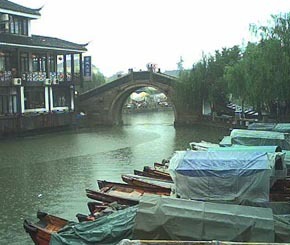 Andrew loves driving boats like this one in China's beautiful parks (2003).